Sony and Square-Enix have been slapped with a lawsuit over charges that the PS3 version of Final Fantasy XIII bricked systems. 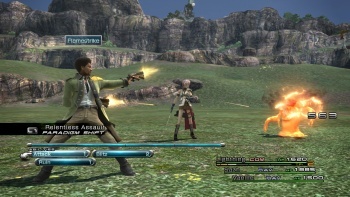 The class-action lawsuit, discovered by IGN, alleges that Final Fantasy XIII will cause the PlayStation 3 to freeze and occasionally render the system permanently inoperable - more commonly known as "bricking." It also blames Sony and Square-Enix for refusing to accept responsibility for the issue, with Sony laying blame on the software and Squeenix pointing fingers at the hardware. "Both Defendants are eminently aware of the damage being cause by their defective products, and have chosen to do nothing about it," claims the lawsuit. This seems reasonable enough, right? I mean, I haven't had any problems with my PS3 and FF13 myself, but sure, it could happen. The terms, on the other hand, are a bit less reasonable. The suit, which claims to represent over 100 PS3 owners, is seeking $5 million from Sony and Square-Enix in damages. So ideally, the plaintiffs are seeking approximately $50,000 per person, when the cost of a PS3 (and FF13) is $660 - at most, if you got the PS3 when it was first released. What, are they suing for emotional damages or something? Are they all going to replace their PS3s with five-grand gold ones? Really, guys? Really?